I am very excited to be taking part in the Sew Mama Sew Giveaway Day 2012 for the very first time! Firstly, hello to anyone visiting for the first time *waves*! A quick intro: I am a stay at home mum to two kids ( 3 years and 10 months) I blog about kid crafts and play, eco crafting and vegan food! 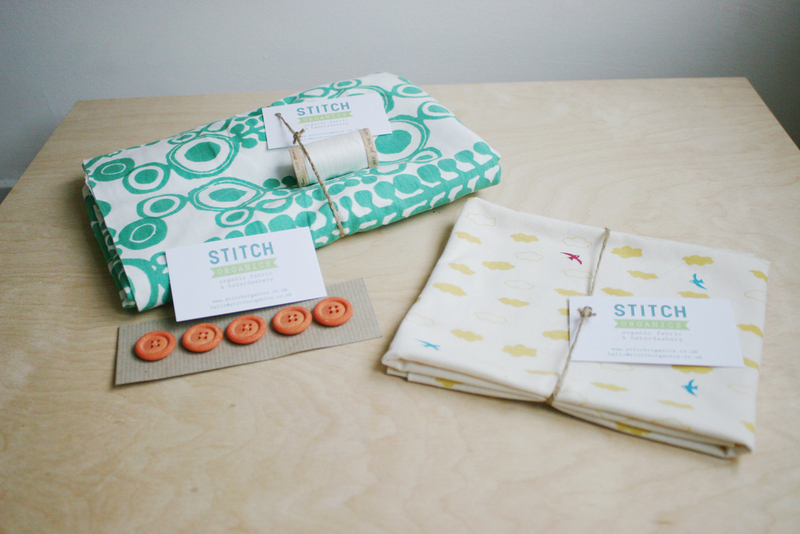 Last month I opened my Etsy store Stitch Organics, which sells organic fabric and haberdashery items. You can find me on Twitter, Facebook, Flickr, and Pinterest, so don’t be shy! There are 3 prizes on offer and I will be picking three winners (one per prize) after the giveaway closes on 25th May at 5pm PST/25th May 1am BST. *The giveaway has now closed* The winners will be notified by email (so make sure to include yours!) and announced on the blog. 1 metre of organic knit fabric: Growing Circles and 1 spool (300 yards/275 metres) of GOTS certified organic cotton sewing thread in natural. Anyone can enter and YES I am going to post internationally. I won’t be sending the items recorded delivery as it costs just too much and I’m sorry to say that if they do get lost or damaged I won’t be able to replace them. 1) Leave a comment (and your email) answering this question: What do you love best about sewing/wearing organic fabric? 2) Answer this question: What eco/organic haberdashery items/notions would you like to be able to buy? 3) Stalk me! Facebook, Twitter, Etsy (favourite items or shop). 4) Share my shop or an item from my shop on Facebook, Twitter or Pinterest! 5) Join my Stitch Organics Flickr group and add a picture of something you have sewn using either organic or repurposed materials. 6) Have a look around the blog and leave me a comment telling me which post you liked the most! Don’t forget to check back with Sew Mama Sew! to enter more giveaways! Thanks for visiting and let the giveaway begin!! Just a little note to thank you all for your comments, I am really enjoying reading them all! I have organic ribbon and ric rac in the works, and I hope to eventually have all those lovely organic fabric designers in stock too, everything else I’m working on!! If you are interested in the full range of organic sewing threads (which I have also used for hand embroidering) please do contact me as if there is enough demand I will order in the full range and it will work out cheaper per spool than current prices. I’ve found that organic fabric truly feel softer, but I love best that it is chemical free and even better, often fair trade! Thanks for the lovely giveaway! What a nice give away! I eat organic so to wear or sew with it when I can is a big plus! My most favorite blog pieces is your food ones!! and your pictures!! I love that it’s organic, no bad stuff in it so it’s completely safe for all the little ones skins ! I love how soft it is!! I enjoy the knowledge that I am not contributing to further degradation of the planet. I think the organic cotton is much softer when washed! Also, it’s comforting to know all of those crazy chemicals aren’t in it! Oooh, what a gorgeous giveaway! I love the feel of wearing organic fabrics and the fact that they “breathe” so nicely. Sewing allows me the freedom to create! Love it. Thanks. I have never had a chance to sew with or wear organic fabric, but I would love to. Thanks for the giveaway! I love making baby items with organic materials because I think in an ideal world that would be all we wanted touching their skin. Thanks for the giveaway. The feel of organic cotton is like no other! I know that there aren’t any dyes or chemicals coming off the garment and soaking in to my skin! I love how soft it is! And I have super sensitive skin. I’ve honestly never bought Organic fabric before. I Like your vegan doughnut post! I like that the cotton used to make these fabrics is produced using more earth-friendly practices and that organic fabric is often softer. Thanks for the chance! I would love to be able to buy organic cotton thread. Glad you carry it! I love the piece of mind I get from organic fabric. Especially for my kids, knowing that they aren’t being exposed to a bunch of chemicals. I really like the care that goes into producing the organic fabrics. I love the softness of organic fabric. Thanks for the giveaway. I love that organic cotton is softer and better for everyone. One of my daughters has eczema so everything helps. I would like to be able to get pretty organic trims. I am a quilter, so I just want fabric, thread and batting to be organic. I can find a little fabric, but the rest …. I love the way organric fabric feels on my super sensitive skin. I love the softness and chemical free smell of organic fabrics. I enjoyed your post about carrying organic thread. I am going to have to try some. I like the more limited effect on the environment! We farm organically, raising produce, crops, and livestock. I have yet to use any organic fabrics. I would love to test drive some, though! softer and better for the environment! you’re a favorite on etsy! ooh- i’d love to see more organic thread! I love the way they feel between the fingers. Monaluna is one of my favorites. Organic fabric is softer, has a more natural feel and -most important of all- doesn’t reek of chemicals when recently bought. i LOVE your KCWC work! those pants are outta this world! I’d prefer to buy organic zippers and organic patches to be ironed on torn clothes – my sons consume them by the stack. I like that I’m supporting our planet when I buy organic; no worries about chemicals. Personally, I’m more partial to the designs organic fabric offers…it’s not cookie-cutter, everybody-has-it fabric. Unique and user-friendly! I’d love to see more organic buttons and ribbon. I love the feel of organic fabric. I like that organic is cleaner for our world. I am a seller of cloth mama products on Etsy, so I value fabrics made of organics very much. The natural absorption and softness of the fabrics are what I love most. Stalk you on twitter and FB and favorited your shop, such cute stuff. I am a seller of cloth mama products on Etsy and love to see more organic thread available for sale to add to my products. I love how soft it is. Thanks for the giveaway! I make a point of purchasing most of my fabric either second-hand or organic, I in order to be a little gentler on the earth with my hobby. And wow, organic fabrics are beautiful! I don’t know if this applies to all organic fabric, but what I’ve played with has always been so soft! I think organic fabric is probably the only organic item I’d pay extra for, but I’d never have thought of organic buttons and those sound pretty neat! I love your recycled robots! frankly, i try to buy organic fabrics mostly to support the industry. voting with dollars, if you will. Thinking about it, are there any organic zippers out there? I don’t think I’ve ever seen any. In any case, I always support more organic thread- I often overdye clothes and it’s annoying if the thread doesn’t absorb correctly. i’m mostly interested in organic fabrics. I love how soft the cotton is. I would love to see more organic trims. My favorite thing is the sustainability factor! I’ve purchased Organic Cotton/Hemp fabric, and when on the phone with the company I purchase it from, they explained how they farmers they purchase the hemp from use it as a natural pesticide! I guess the oils and scent it gives off keeps the bugs and other critters away from their main source of income.. in their cases it’s the BY-PRODUCT of their farming. The company buys it from them and this allows them to live better.. instead of just barely making ends meet, they are able to send their children to school, eat better food and just overall have have a higher standard of living. I’m eying up that ladybug fabric in your shop-so cute! Thanks for the chance to win!! I try to use organics for my home dec projects, and most recently did drapes for my little guy’s room. I love how soft it is! I love how soft the organic fabric is for my baby. Organic cotton is so easy to sew with. I like the fabric craft posts on your blog. I have never used organic fabric, but I like the idea to make life better for the people who pick and process cotton not to have to be exposed to all the chemicals used to grow it. Less chemicals in this world is great! Organic threads would be nice and wouldn’t organic spray basting be great! I’ve never worked with organic fabric, but am very interested. Organic always seems like a better choice. I haven’t sewn with organics, but I have some in the stash, they just haven’t been made into projects yet. I like the idea of using them for the environmental impact. Organic textiles make me feel as though I am doing the right thing! Thanks for the giveaway, that fabric is gorgeous! I’ve never sewn with organic fabric before as I tend to use scraps that I have received from others. But I do own an organic cotton t-shirt. It is so soft and warm. And I would love it if I could find organic ribbon/embroidery floss that didn’t look.. organic.. if that makes any sense at all! I love organic fabric because it means that I am using material that was not exposed to harsh chemicals. I also love it because I can use it for baby things (clothes, toys, etc) without worrying about what my child will be exposed to. I’ve never actually sewn with organic but would love to give it a try and see what difference there is!!! I’d like to be able to buy some organic fabric but the price is often way to much! I like wearing organic fabric because I feel “healthier” doing it – it’s very mental for me. Organic tends to feel softer too. I love the feel of organic cotton and a lot of times I like the designs more, too! Zippers are one thing that I wish I could find. My local stores don’t stock much that’s even cotton, and it’s a pain to shop online for things like zippers ’cause I usually buy for a particular project… and almost always when I’m almost done with it, so the waiting is killer. I worry about the impact of the pesticides used in conventional cotton growing so by supporting growers of organic cotton I feel that I’m doing my small part. Love your organic things! I didn’t know they did buttons..awesome! I like wearing organic materials – you can tell they let your skin breathe. I love supporting companies that make organic products. And bonus, I notice the prints are more modern. I think I would buy organic thread to sew with as far as haberdashery goes, since I now know they make organic buttons! Maybe some lovely ribbon too, or twill. I love the organic fabrics out there…the colors are gorgeous and the designs are fantastic. I only wish it were cheaper so that I could buy more of it! I love the soft texture of the organic fabrics. I think organic fabrics just feel better. Thanks for the giveaway! I think wearing clothes made from organic fabric is good for the skin. Wow, great giveaway! Organic cotton is just the eco-friendly way to go, as well as ahving such excellent quality – no-brainer really! Thanks for the giveaway! I have not had the chance to use organic fabrics in my sewing yet. This makes me sad. Here in south africa it is really hot — so natural fabrics is a required part of dressing. I wish that we got more natural organic fabrics here without the boutique prices. I wish that you could get things like ricrac and a larger range of buttons. I love that I feel good about using organic products because they are better for the environment we are leaving behind for our children. I’ve only ever sewn with one organic fabric. I do love the prints they offer…they are always so pretty! I’ve never sewn with organic fabrics, but I would love to try! I haven’t tried sewing with organic fabric yet. I have only seen it at one shop and it was so soft, the pattern just didn’t make me happy. Thanks for the chance to win. I like using organic productsand craft supplies just because it makes me feel better. I make some baby items for my shop using organic fabrics, so I love the feeling that a baby will be snuggled up next to pure softness. I feel like organic cottons are so soft, you just kow you’re using a quality item. For notions, I love a good thread selection-more than one brand, and lots of colors! 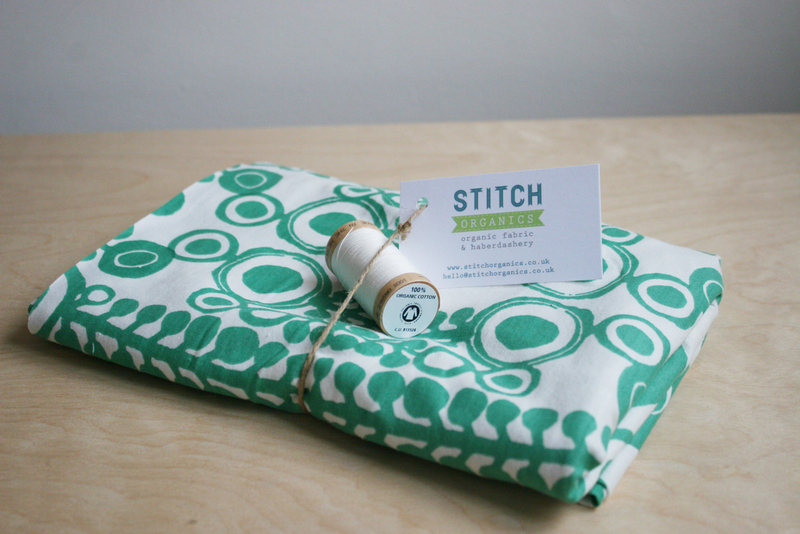 I am really excited about all the organic fabric available at the moment! Your selection is beautiful! Thank you and have a nice sunny week ! I have never sewn or wore organic fabric but I can’t wait for the chance to make something for my daughter out of either of these beautiful fabrics! Organic cotton is so soft and smooth and I love knowing that it is better on the environment. I love that I know they won’t bother my sensitive skin or my son’s! I love how soft feels! Cuts great too! Thanks for the Chance to win! I am a new follower via RSS! I love the softness. That growing circles fabric is beautiful too! I love how soft organic fabrics feel on my skin. Organic cotton feels so lovely, and is so very soft! I’ve never actually see organic fabric in person. Organic fabric just seems so much softer to me. I like that you choose between food, family, quilt and making clothes – it is all in your blogg Not a special one….. likes all. I’ve never used organic fabrics but I’d love to try them ! For me organic fabric is an ethical win! I enjoyed your post on ‘this is not a zigzag tote’!! I love the feel on my skin! Thanks for the chance to win. I love that I can feel extra good about my baby girl wearing and using things made from organic materials. I think organic fabric feels better, and it also comes with that feeling that, although it may be small, you’re doing something for the enviroment. However, lot’s of organic fabric is out of my price range, so this would be a great opportunity to try an organic Eco warrior project! Organic fabrics seem to get the cutest prints! Your recycled robots post is so cute! I’d love to do that with my kids when they’re older. Thanks for the chance to win! I’ve never used organically grown cotton. I love the idea and would love the chance to sew with your giveaways items. Thanks for your generous giveaway! I like that organic doesn’t contribute to the awful chimicals used in cotton production. I love the idea of buttons made from recycled items. Would love to see more of those available in your shop. Thanks for educating us about these items! I have added your Etsy shop to my list of favorites. Take care! Hi there! I haven’t had a lot of chances to work with organic fabric but I just love how soft it is! That birds in the sky print is darling! 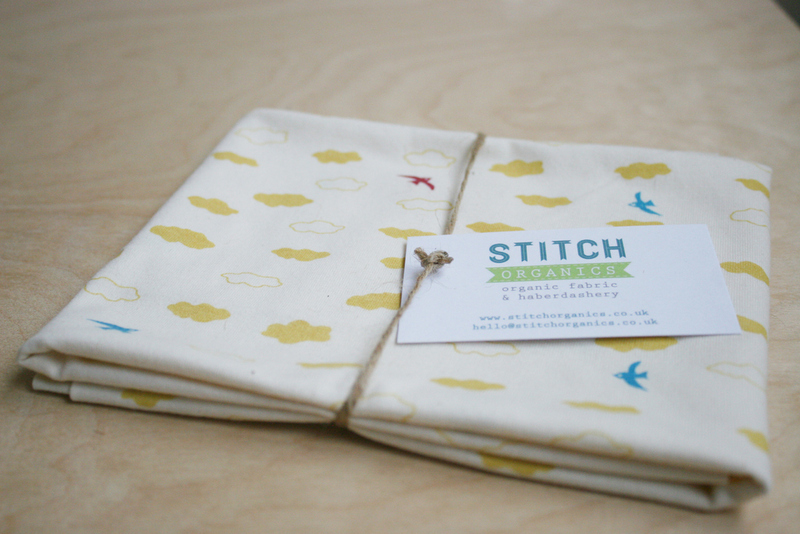 I love the softness of organic fabrics…and I really love the birds on the one you are giving away! I love the soft feel of organic cotton. I think organic feels softer to the touch – as well as the soul! Mostly, I just wish I could afford to buy more organic fabric. I have never used organic fabric I dont think, except for quilting cotton, I like it because it is very soft. I like your “A tale of two cushions” post. I’m thinking about taking on a similar project soon. i love the softness of the organic fibers. I think organics are softer, but more importantly, I feel healthier using it! I haven’t yet had a chance to sew with certified organics, but I love the side-effects of products that are safe for the environment and our skin. I like that organic fabrics are better for our environment. I adore that bird fabric! I really have enjoyed the softness of the organic fat quarter set i have for baby boy’s quilt. It’s beautiful with almost a sateen feeling. I think it is softer and like to think that it is environmentally friendly…thanks for the chance! #1 – the breathability. Thanks for the giveaway! #2 – more organic buttons. Thanks! the Sugar Free Vegan Chocolate Cupcakes. Thanks! I love the feel and colors of organics. I think I just like the whole idea of organic. I love that when you finish the product, you feel great that it was made with great materials and won’t harm the recipient. It can be cuddled with or worn with no worries. I really like the organic thread. I don’t think I have ever really thought about that. And organic embroidery thread would just be AWESOME! I love the texture, but also some of the wonderfull prints available. I’m a new stalker. I’m so in ‘Like’ with you on FB. I have never sewn with organic fabric. I would love to try! Somehow organic just feels nicer. Never tried organic knits before, but they look scrumptious. I have never heard of eco buttons before – I think that is a neat idea. How about cotton/twill ribbon? I like to use organic fabric because I know it’s not toxic for my kids! I don’t know if I’ve ever used it so I can’t say. Just knowing I don’t have to worry about what might be rubbing off onto me. Great giveaway, thanks! When I wear organic fabric I enjoy the feeling both physical and psychological. Physical because of softness or other pleasing texture and psychological because I feel I am doing something to help the earth. I visited your Etsy shop and found several favorite items and added your shop to my favorites so that I can access it easily in the future. There are two things that I especially like to buy that are organic and not always easy to find. One is jersey cotton, oh and soft cotton toweling. The other is organic trims – laces, ribbons, etc. I can crochet my own lace from organic cotton but sometimes it would be nice just o be able to purchase it. Mercy me. Your vegan recipes look very tempting. Do I dare try vegan doughnuts? I might get addicted. But your Thai chick pea and sweet potato dish looks terrific and I intend to make it soon. In fact I put it on my Pinterest board “recipes for reference” so I don’t “lose” it! • • • It’s so much softer. I love organics! So much better for us and the environment! I have actually never worn or sewn organic fabric but I hear it’s softer than regular fabric. I love feeling like I’m doing something good for the earth! I love the softness of the fabric. I like knowing that the cotton fabric I am working with wasn’t laden with chemicals as it was being grown. Thanks for the chance to win! I love that it is just slightly better for ourselves and the environment! I love to think that the organic fabric is replenishing the world instead of poisoning it with chemicals and leaching all nutrients from the soil. I like the look of the Eco buttons and would love to see more of them. 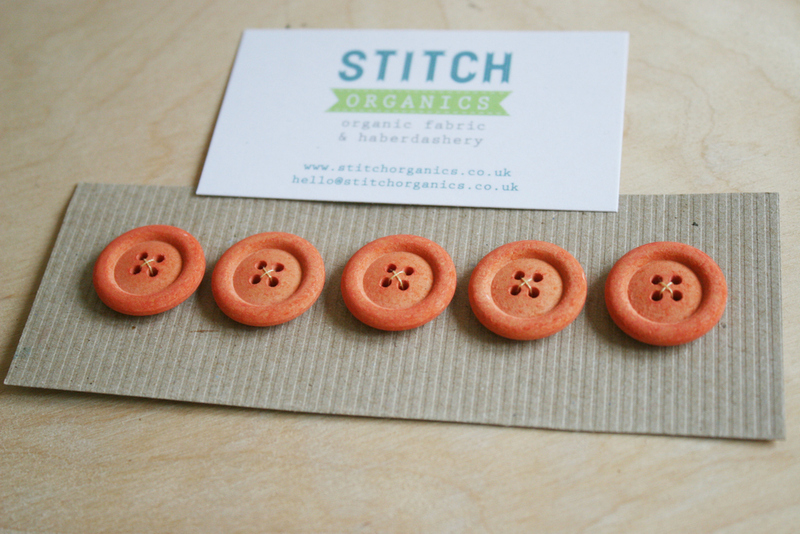 I love organic buttons and other fun sewing notions! The thing I like best about sewing with organic fabrics is that I can make baby gifts without worrying about nasty chemicals having an effect on a vulnerable newborn. Thanks for the giveaway. I enjoyed the KCWC post about the Express Tunic. Lily is so cute modelling it. I like the ideas of no chemicals. I really like the feel of organic fabric. I added you to my favorites on Etsy. It seems softer, doesn’t it? I love that it mean’s I’m helping to look after our beautiful planet! I just bought organic fabric for the first time a few weeks ago, and apart from how soft and beautiful it is I love that I can feel good about buying it. Thanks for the chance to win! I don’t know if they even exist, but I would love to see zippers made from recycled materials. I love the feel of organic fabric, and of course the fact that it is earth-friendly. Thanks for the chance to win! I haven’t actually sewn with organic cotton but would love to try. Thanks for the giveaway! I have never worked with organic, i would love to work with those fabric. never worked with organic but like to try for my kids. I only have one sweater made of organic cotton, but I love that it gets softer all the time and it’s very easy to care for. I love the hand of organic fabrics. I feel better about the environmental impact versus traditional fabrics. I love cotton for how breathable it is, but I often feel guilty knowing how resource-heavy its production is. Organic cottons are a solution for that feeling! Beautiful!! I work for an organic nonprofit, I eat organic food, and I love sewing with fabric made with organic cotton. I love knowing that the cotton was grown in an environmentally friendly way! It makes it that much more wonderful when made into a toy for my baby. I love your chicks print– so whimsical and cute! I have bought some Birch organic cottons and love the feel of them. I haven’t tried organic thread. I will have to look into it. (Once I get over my aurofil fixation). I saw several post about re-purposing clothing as material. I have a definite interest in re-using items in a new and different way. Organic everything just makes me feel good for supporting the earth and natural products always feel better. What a lovely giveaway. I’ve never worked with organics before, but I would think they would be cool and easy to work with. Thanks! I love the softness of organic fabric. I would like to be able to buy more organic home dec fabrics. I haven’t used a lot of organic fabric, but I’ve gotten some cloud 9 so far, and it’s fantastically soft and I am wondering if thats common for all of them. Thank you for the giveaway! Great giveaway! I have found that organics just feel SO much better & look better quality also! Thanks for the giveaway! I love the feel on my skin. I have been starting a backwards revolution with my crafting. No more machines! Hand sewing only. I get to touch every inch of the clothes that will adorn my two year old daughter. Creating something with this much time and effort demands the best (and safest) eco friendly fabric! cheers to organics! I have very sensitive skin and a lot of chemical allergies. organic fabrics don’t irritate or make me itchy. more buttons! and other little doo-dads like that to add interest. ribbon. rick rack. that kind of thing. just because it’s organic doesn’t mean it has to be bland, right? This would be my first time using it and it would be lovely, I’m sure. Thank you! I liked you on FB. And I was going through the things you’ve made… I adore the envelop tunic!!! I love the envelop style of baby tees and think it’s so innocent and sweet. I hated when mine grew out of them! that little dress would let a very sweet little niece hold onto the innocence of envelope baby tees a wee bit longer! Tell you the truth I’m not really a fan of organics. If they are the same price as regular I’ll use them. I do like the muted, natural colors. I like using organics when I sew baby clothes because it is free of harsh chemicals. My jaw dropped when I read “organic rick rack” ! LOVE! I like wearing organic because sustainable always feels better for the soul!! I love organic fabrics because of their softiness. Organic fabric is fabulous, it feels softer and is definitely more eco friendly. I love the hand of organic fabrics. They don’t have that chemical crunch. I love that organic fabrics are kinder to my skin as well as the environment. I love how soft it is, my kids have pyjamas and they are so cozy. Pretty fabric! I love that they are knits! I love using organic fabrics because I mostly sew for my children. Knowing that what is covering their bodies is safe and natural gives me a fuzzy feeling inside. Thanks for the chance to win! I love knowing that the environment is cleaner because all those chemicals weren’t used! thanks for the chance! Also, I had no idea there were recycled buttons, I’d like to see/buy more of those! I’ve not used organic fabric before. I love how soft organic cotton is! To be honest, I’ve never seen any organic cotton in person, so I don’t know! I love organic fabrics because I try to be more eco friendly even with my fashion choices! I like the fact that there are no chemicals. Thanks for the chance to win. Organic fabric is sooo soft and it breathes. Oh, my goodness! Such beautiful items! I love the natural appeal to organic fabric. I think organic cottons feel softer and I like knowing they aren’t all full of chemicals since most of the sewing I do is for my two year old. I’ve never used organics, but I love the concept and would love the chance to try them. I would like to see items that I am using to be more “green” made in organics – cloth napkins, cloth diapers (although my kids are past that stage now, thank heavens), shopping bags. I like organic because it somehow feels cleaner and it’s nice to know that it’s not as harmful to the people making and using it. I really wish more of the eco art supplies were available and more reasonably priced. Love the softness of organic fabric. I love being able to use natural and organic materials. I have never sewn with organic fabric! But I would LOVE to try some! I am obviously supportive of the environmental benefits. I love the softness and usually there are “simple” pretty designs available! I love the feel and the richness of soft, organic cotton. Thanks. I don’t necessarily by new organic fabrics but I do use alot of repurposed wool from clothing — wish that there was more light coloured wools to be found, most is black brown or grey and that limits the palette for creating! I just love knowing that I am supporting the organic cotton industry, and it makes me feel like I am using something even more special in my project. Thank you for the chance to win one of these great prizes! I don’t use a lot of notions in my work, since I mostly quilt. That said, I had never really thought about recycled buttons before, and I am starting to get into a little bit more of clothesmaking, so I’m sure I will start to use buttons, and now I will know I can locate some eco-friendly ones! I follow you on twitter and I tweeted the giveaway! Thanks for the opp! I’ve only used organic fabric. There’s something about the texture, I don’t know, it seems easy to work with. The best thing is that they feel good on you and are good for the planet. I love knowing that from the point it’s grown until it’s being worn by my loved ones, organic cotton is good for the earth. Eco-friendly buttons are my favorite notion. I’ve been using wood buttons from fallen branches that are locally made but I’m really a fan of all earth friendly buttons. It’s so much softer. Love your giveaway selection. I love the post on the bee bubble pants you made. They really made me want to get my Growing Up Sew Liberated book out and do some sewing. I love the softness of organic knits! I joined your flicker group and added a picture of a project where I used re-purposed materials. I’d love to be able to buy lots of eco-buttons made from natural materials! The post on the double chocolate cookies is scrumptious. I find it softer! Thanks for the chance! I love using organic fabrics for my kids… I worry so much less that way! I wish organic fabrics were available in a wider variety of prints. My favorite thing about organic fabrics is knowing that there aren’t any chemicals that in 20 years they are going to find out cause cancer, extra limbs to sprout, or the end of the world! I’m a fan of how soft it is! i think organic fabric feels better. but i always wonder, is it made ethically as well? thanks for the giveaway! I love the feel of organic. Thanks for the giveaway. I like seeing more organic knit fabric, like you have. Thanks! I’ve never sewn with organic fabric. Heck, I don’t even think I have ever felt any. I like knowing somehting soft and safe is next to my son. I love the feel of organic cotton … amazingly soft! I would love to see more organic fabrics in bright colors! I actually have never sewn with or felt any organic material but I would love to give it a try. I run and eat healthy and would love to carry that through to my sewing too. Organic fabric always seems softer. All of the organic fabric I’ve used has had the best hand – it cuts and sews like a dream. I love it! The softness can’t be compared. I love organic fabric. My favorite thing about organic fabrics is how soft and lovely they are to work with. Thanks for the giveaway! I would love to see more organic scarves and head scarves out there as far as haberdashery items go. Otherwise, baby toys. I started one of the biggest sustainability projects in my state, so I guess the whole “organic” thing is just a way of like for me. We cook with whole foods from the farmer’s market and I try to sew with as many organic fabrics as possible to keep the chemicals and synthetic fibers away from our home. i dont even know what organic fabric is D: *shame* i found sewmamasew.com and im trying to learn as much as i can! soo caught up in all these giveaways im not even sure if im entering right because im so new! hehe anywayss thanks for the post! I love the feeling. Plus, the prints just seem so beautiful! Thanks for the chance. I wish that I could buy a more organic meat. I try, but it has been a couple years since I could afford a side of beef. Still working towards it. I have never sewn with organic fabric but would love to! Thanks for an awesome giveaway! I just love how soft it can be! LOVE the softness. Lays so well. commented on facebook about your shop. I like that the production of the fabric is not adding even more pesticides to the environment. I like working with organics especially for my grandbabies. its durable too. I joined the flicker group and started a discussion on repurposed items. It’s the best for my babies skin! Thats what I love about it! I love that I get a little warm fuzzy feeling that I didn’t hurt the earth as much for what I am using and also it seems they are generally of a really high quality. I have never used organic fabrics but I would love to try. Thanks for the wonderful giveaway! I would like to try organic fabrics and also ribbons and thread. Thanks for the chance! I’m following you on Facebook (Paula Lemos), Twitter (ap_lemos) and hearted you shop on Etsy too. I like how organic fabric has a softer feel. I think it just makes you feel like it’s cleaner- I don’t know if that makes sense. I love that I’m not smothering my skin in chemicals that aren’t necessary and how soft organics are. I pinned the cute birds! I love it!! I love organic fabric for any projects for kids. I feel like it is safer on their little baby skin! I have yet to sew with organic fabric but love love love to wear it. I love knowing that the entire process from field to finished item is better and I love the feel of the material. I love feeling good about my purchase knowing that it is sustainable. I actually haven’t done any sewing yet with organic fabric – So I guess i’m looking forward to trying it out for the first time! I love being able to put my wee one down to sleep covered in a chemical-free quilt I have made myself. Thanks for the giveaway! I have just started sewing and would like my little one to wear organic cotton next to his skin. I love knowing the whole process of organic cotton makes a positive impact on all who are involved and the lack of chemical smell! not like going to the local fabric superstore! I love organic fabric, simply because I feel its better for me, and everything (the earth) as a whole. I want to support less pesticide use, and hope that demand will equal change. Thanks for the chance! I wish all fabric was organic and all button and notions were made from upcycled/recycled stuff!! But I particularly like Organic fabrics that are unique, hand made, so special. I favorited your bumble bee and ladybug fabrics, just right for my shop’s Organic Baby Sleep gowns! Totally inspired by your bean treats! I shared your shop on facebook! Great giveaway, I love how soft organic fabric is! I’ve never used organic fabrics before, but would like to try them. I like feeling that my skin can breathe. I like the softness and the fact that I know I’m not contributing to environmental degradation and the creation of sperweeds (superweeds really freak me out). I love the texture and softness of organic fabric – it’s silky. I love using ethically produced goods, no pesticides against my little ones skin is good too. I haven’t worked with organic fabric before, so I would just be looking forward to trying it! I have only just started using organic fabrics, I didn’t realise how lovely they feel compared to normal cotton. I love all the details, so lovely, organic ribbon, ric rac, buttons, trim, etc I would definitely buy. I love how it feels and the fact that I know there’s no nasty stuff up against my skin! Whenever I see the word ‘organic’ I look twice; I guess it’s because it makes me feel good about clothing my family in it. Plus it is earth friendly. I love knowing that organic fabrics don’t have any nasty chemicals and are better for me and my family. i love the soft hand of organic fabric. I like the way organic fabric launders–it just gets softer with every wash! I’d really like to see trims and more hardware. I favorited your store on Etsy. I love the peace of mind that comes with sewing with organic fabrics. organic fabrics are fresh feeling and makes it great like you are being responsible to the earth! liking you on facebook thanks for great giveaway! I really love the feel of organic fabrics. They’re softer, and feel like they’re longer lasting! Organic is a better way to care for our selves and our world. I’d like to start buying more organic batting. I love the feel of the organic fabric! i make a lot of clothes for my great neices and nephews and i like that the organic material is so gentle on their skins. I love how the organic fabric feels. The one I bought so far was so very soft! i like the concept of organic fabric – grown without pesticide, with care. The feel is definitely a reason I love organic. Honestly, I haven’t had a ton of experience with organic fabric yet, but the few times I’ve had a chance to handle it, I’ve been blown away by the softness. So cozy! I love the softness of the fabric. Thanks for the giveaway. I just love the feel of them. So freaking soft. I like knowing I’m not exposing my kids to the pesticides used on conventional cotton. Thanks! Maybe its just me, but it seems that these new organic cottons are amazingly softer than regular (could just be in my head)! I think buttons would be cool–never seen those before. Also maybe some eco thread. It feels so nice! and esp for babies soft skin. I’d love to see more choices for the buttons. I didn’t even know those were available! although i am not usually a very eco-friendly person, i do love the feel of wearing organic cotton. i swear it’s softer! i favorited your shop on etsy. the fabrics are cute! how neat are those buttons! i would like to see more of them, and some variety of them! i pinned an item from your shop to one of my boards on pinterest. Being a beekeeper I like knowing that the plants didn’t have the nasty sprays and such on them at the farm level! Organic batting would be nice! I like the idea of knowing I don’t have to worry about all the nasty chemicals when sewing with organics. Thank you for offering this prize! Oh my — this is not a “Cheater” entry, but I think my post didn’t accept my contact info. Debi — ialady44 at yahoo dot com. Thanks! I’d like to be able to buy those orange buttons. They remind me of the red dirt in Arizona when we visited there years ago. I love sewing because I can make items that are personalized to the person I am going to give to. What I love most about organic fabrics is how soft it is, and knowing it isn’t full of chemicals. Thanks for the great giveaway! I’d love to see organic ribbon, but mostly it would be to have lots of great prints and colours for fabric. Thanks! I love how soft organic fabrics tend to be and how they’re safer for my little guy’s sensitive skin! I don’t think I’ve ever sewn with organic fabric. I love the feel of organic yarn, however – it just feels softer to me. I try to buy organic whenever I can – I like to minimize my ecological footprint as much as possible. It’s nice to indulge my crafty nature without doing serious damage to the planet.